A colour photograph of the train station in the Miniature Village at Cullen Gardens. The train station is a replica of the Station Gallery (Whitby Junction Station) located at the corner of Henry and Victoria Streets in Whitby, Ontario. 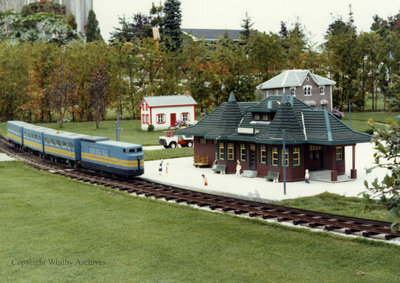 Train Station in the Miniature Village, Date Unknown, Photographer Unknown. Whitby Archives A2013_042_193.